We had a beautiful day!! 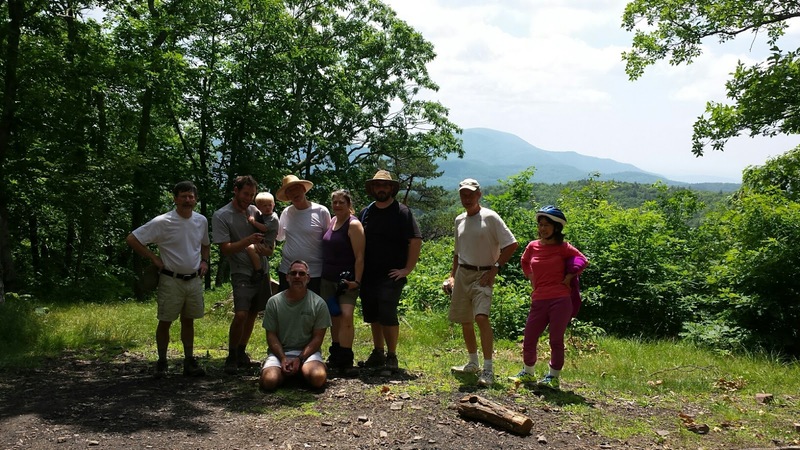 Hike leader Kelly O’Rourke joined by Charles Staples, John Sinclair, John Brandt, Grace Niu (from Lynchburg), CJ Washburn, David Crowe, his two sons Nate and Brent, and grandson Emmett (from Kentucky) to make the loop in the St. Mary’s wilderness. We all lunched at the top overlooking Three Ridges and the Priest. David’s group went back and the other five of us finished the 10.3 mile loop. The water level was low so the stream crossings were easy (the down side is the waterfalls are not very spectacular as they are in the spring). We saw some huge mushrooms and enjoyed the peace and solitude of the wilderness. Six enthusiastic PATC members: C J Woodburn, David Crowe, Brian Muszynski, John Brandt, Iva Gillette and Kelly O'Rourke greeted hike leader Barbara Martin at Rockfish Gap. We headed out in 2 Beamers to start our shuttle, leaving one car at the starting point at Dry Branch Gap and the other just past Buffalo Gap on Rt. 42. We finally got started on North Mountain Trail around noon. We were all delighted to find a wealth of lady slippers on the trail, more than anyone had seen on any other trail. We also spotted several other wildflowers we hadn't seen before. The views were fantastic. We climbed up to Elliott Knob on the gravel road and had lunch on the now unlocked fire tower. We had a harrowing and slippery hike down the gravel road to Falls Hollow Trail where we enjoyed a dip in one of the many pools. On the way back to the car everyone, but Iva enjoyed a black snake's acrobatics in a tree. We finished our fun day with dinner at Baja Bean in Staunton and ice cream at Split Banana.